Specialized in Luxury Real Estate in the Sedona, Arizona. With a background in international law and marketing, Elisa combines in depth local knowledge and worldwide professional experience. She is fluent in French and Italian and attracts international buyers from Canada and Europe. Elisa has a Juris Doctorate Degree from the University of Milan, Italy and won the Erasmus scholarship in International Law at University of Paris in France. She is a world traveller and has extensive background in interior design, art and marketing. She has several years of international marketing experience. She was marketing director in various corporations: at Domus, a renown architecture and design magazine; in San Francisco at Workspeed, a developer of a web-based application for large commercial real estate. Prior to Workspeed she was marketing manager and researcher for Sidoun, a software developer for the architectural, real estate and engineering industry. You can find her on Google+, on this Sedona Real Estate Blog, and on Facebook. She has lived in Sedona for 12 years. 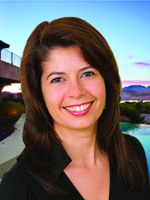 She is a Realtor with Russ Lyon Sotheby’s International Realty.